PARIS ― North Korea has offered to dismantle all of its nuclear weapons and material if the United States takes "corresponding measures" and promises security guarantees, President Moon Jae-in told French President Emmanuel Macron during their summit at the Elysee Palace, late Monday (KST). "During the summit, President Moon told Macron that North Korean leader Kim Jong-un offered to completely dismantle all his regime's nuclear weapons and material. The North Korean leader also said he will scrap all nuclear facilities and missile test sites," chief presidential secretary Yoon Young-chan said in a media briefing after the summit. The South Korean leader asked his French counterpart to persuade the United Nations Security Council (UNSC) to modify sanctions on the North in light of its denuclearization promise. France is a permanent member of the UNSC. Yoon said Kim revealed the updated, detailed denuclearization roadmap during his latest summit with Moon in Pyongyang. President Moon quoted the offer after saying North Korea will not go back on its repeated denuclearization commitment to the United States as Kim is determined to develop his country's economy. "If U.S. President Donald Trump agrees with the North's leader Kim Jong-un to declare an end to the Korean War following the Panmunjeom Declaration, at which the leaders of the two Koreas committed themselves to bring about a formal end to the conflict, that will be a great starting point to build a permanent peace. Beyond that, it's possible to expand humanitarian programs and to have discussions on more social and cultural exchanges," Moon said in a written interview with French newspaper Le Figaro. A full transcript of Moon's interview translated into Korean was confirmed by Cheong Wa Dae. Speaking to the daily ahead of his second summit with Macron, late Monday (KST), the President said Seoul was expecting Washington and Pyongyang to begin discussions aimed at establishing a liaison office between North Korea and the United States, and the easing of economic sanctions. "My clear understanding from the talks with the North is that North Korea is experiencing huge economic difficulties because of the continued economic sanctions imposed by the international community. If the North breaks its commitment to denuclearize, Pyongyang has no ability to handle retaliatory measures to be applied by the United States and the international community," Moon said. The South Korean leader earlier called on the United States to match the North's efforts with reciprocal measures to push the nuclear negotiations forward. "North Korea is moving on the international stage toward new prosperity after a long isolation. I believe it's time for the international community to respond with more than words to the North's concerted efforts toward denuclearization and its tough decision toward that path," he added. At the summit with Macron, Moon said the two countries agreed to work together "closely" toward complete denuclearization of the peninsula. "We agreed to completely cut off the cold war mentality that has endured on the peninsula for many decades," Moon said at a joint press conference after the summit. South Korea and France agreed to share insight and "historical meanings" from the agreements between Seoul and Pyongyang, and Pyongyang and Washington, at which each of the leaders of the countries committed themselves to bring about a lasting peace on the peninsula, according to the President. "We appreciated corresponding measures currently being taken by the two Koreas and the United States aimed at dismantling North Korea's nuclear development programs," the South Korean leader said, adding the two also agreed to take several relevant steps toward denuclearization. The remarks came a few days after U.S. Secretary of State Mike Pompeo wrapped up his fourth visit to Pyongyang. Pompeo hailed the outcome of the trip, saying it marked "real progress" regarding the agreement between Trump and Kim made at their June 12 summit in Singapore. 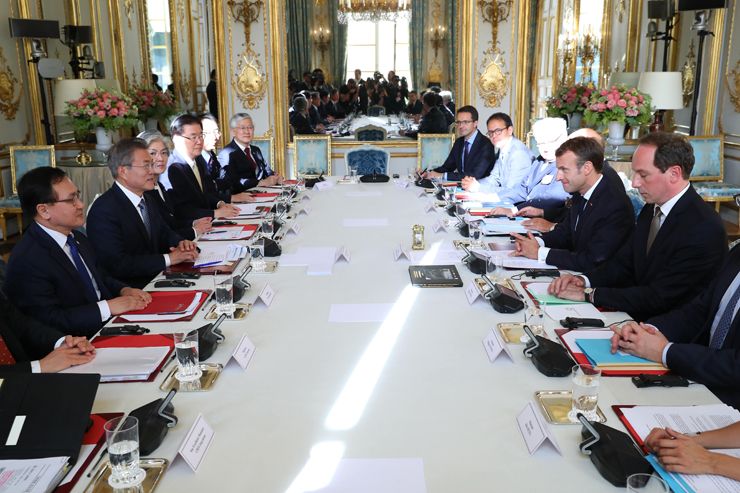 Separately Moon asked Macron to assist in ensuring South Korea-manufactured steel products were exempted from tariffs following the European Commission's decision to launch a safeguard investigation into 26 types of steel products. Regarding his meeting with Pope Francis at the Vatican, Thursday evening (KST), Moon told the French newspaper he would deliver an official invitation from Kim for the Pope to visit North Korea. Expanding inter-Korean economic projects amid improving North-South relations will be an "accountable and measurable way" to help Pyongyang make improvements in its human rights situation, according to Moon. For decades, the international community has largely sidestepped its responsibility to hold the North to account for human rights abuses. "Decades of confrontation between the two Koreas since the armistice ended the Korean War delayed the development of democracy. Even more problematic is that South Korea is spending huge amounts of money because of the separation. Building a permanent peace on the peninsula is the process to heal such wounds and to help us open the door towards a new prosperity," Moon concluded.